Train services on a major route were disrupted when 10 electric locomotives were damaged by faulty electric cables. LNER later said five of the locomotives had returned to service between London King's Cross and Leeds. Earlier advice for passengers to avoid travelling has been lifted. Tickets for travel on Tuesday will be valid on Wednesday, or can be refunded. A Network Rail spokeswoman said it was investigating. Repairs to the overhead cables are being carried out. 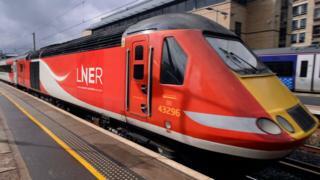 Passengers were warned "residual" delays were likely to continue on a large stretch of the line from the north-east of England to London through Tuesday night. LNER tickets will continue to be accepted by other companies. The operator advised early-morning travellers to check for any last-minute alterations to services. A Twitter post by LNER said "multiple locomotives arriving at Kings Cross" were found to have damaged pantographs - devices mounted on the roofs of electric trains to collect power from overhead cables." LNER managing director David Horne said: "If the trains had continued in service there was the risk of further disruption and damage, so we took the difficult decision to take them out of service. "The damage to the trains was caused by a faulty component on the overhead power line between Peterborough and Stevenage, and Network Rail engineers are now working on it." Trains are being diverted in a different section of track to allow the engineers to work safely. #LNERUpdate Due to amendments/cancellations of several LNER services this morning, customers are advised NOT to travel today. Tickets will be valid for travel tomorrow (17/04/19).